Bright blue with white speckles and a beautiful little horse on the front. 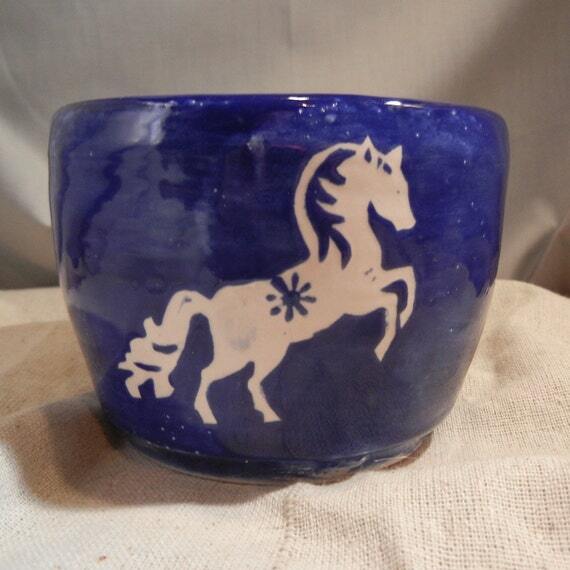 Great little bowl for horse lovers. The bowl is approximately 3.5" across and 3" deep. The bowl has been fired and glazed, handwashing recommended. Folksy :: Buy "Spot My Heart Ring"
Folksy :: Buy "Moo - ceramic cow brooch"
Folksy :: Buy "Personalised ceramic butterfly brooch"